Michael Crawford, the original star of Phantom of the Opera, made a surprise appearance on stage as the musical celebrated its 30th anniversary. The actor received a standing ovation from a delighted audience as he joined cast members to sing "happy birthday" during a special finale at Her Majesty's Theatre on Monday night. "It's quite thrilling to be back," Crawford told the BBC afterwards. "It's a very, very special show in a very, very special theatre." Crawford had dashed to join the celebrations after performing in his own West End musical, The Go-Between, which ends its run this week at the Apollo Theatre. "I have to pray I've got a voice tomorrow," Crawford quipped, "we've still got five days to go." Andrew Lloyd Webber's Phantom of the Opera opened at Her Majesty's on 9 October 1986 with Crawford starring opposite Sarah Brightman as Christine. It is the third longest running show in the West End after The Mouse Trap and Les Miserables. Crawford said one of the perils of playing the Phantom was having to avoid the holes where candles came up through the stage floor. "I was always worried the candles were going up my trouser leg," he said. "It's wonderful to see the amazing company tonight," he added. "It's the most superb show. This was one of the last great musicals where a lot of money was spent." The birthday celebration also featured former cast members Michael Ball singing alongside current members Ben Forster (The Phantom), Celinde Schoenmaker (Christine) and Nadim Naaman (Raoul). Sierra Boggess, who will play Christine in the first French version of Phantom, performed the song Wishing You Were Somehow Here Again accompanied by Lord Lloyd-Webber on piano. The opening of the French production was cancelled after a fire last month at the Mogador Theatre in Paris. The show had been due to begin on 13 October. Speaking onstage at Her Majesty's Theatre on Monday night, Lord Lloyd-Webber recalled how Crawford had been recommended to him by the singing teacher of his then-wife Sarah Brightman. He went on: "Everybody says what a huge spectacle Phantom is, but it is in fact a very simple set." "But it's quite expensive," added the show's producer Sir Cameron Mackintosh. 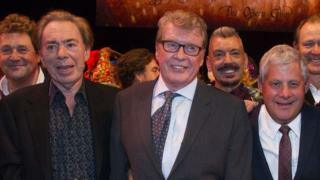 Sir Cameron told the BBC that he and Lord Lloyd-Webber were "thrilled" that Phantom had reached its 30th anniversary. "We both loved musical theatre," he said. "We wanted to do something new with it, but at the same time embrace its past."